The old business (part 1) first. I've decided to use the sloppy plaid for the shawl cardigan. In blog, Twitter, and Facebook comments, the white mohair camp held a slight lead. But the styling suggestions from some of the off-kilter plaid contingent are what swayed me. In the end, I realized, I'd have more opportunity to wear a "statement" jacket; it would fit more easily into wardrobe than the mohair. I'll eventually be using the fluffy fabric for a cardigan, but probably a less classic style -- something with an edge, an asymmetric element maybe, or just an unusual cut. Creative juices are flowing! I'll be following all the green checks and changing or ignoring the crossed out instructions. Right in that section entitled "Cutting", there are steps that will act as my guide, even though I can't follow them exactly. In this post I won't get very far down the list at all! I've said yes to the preshrinking. That's why I hand washed the fabric. *I'm not really pressing the fabric. 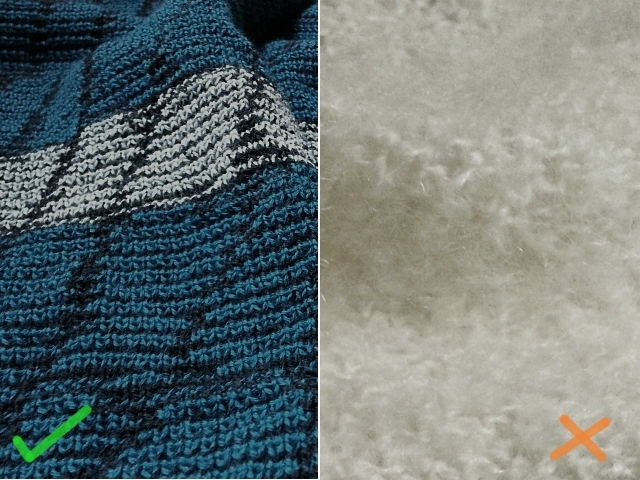 There are a couple of exceptions, which I'll get to in a later post, but I generally say no to pressing sweater knits. Instead I steam the fabric, as necessary, never quite touching iron to fabric. 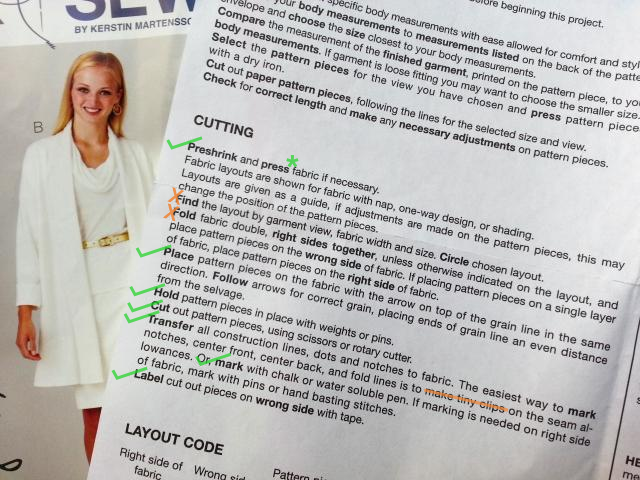 I won't be able to use any fabric layout suggested in the pattern instructions for two reasons. One, I'm using fabric that I personally knit on my vintage knitting machine, and this fabric is narrower than any suggested layout offered. And two, I'll be cutting my pattern flat, one piece at a time. 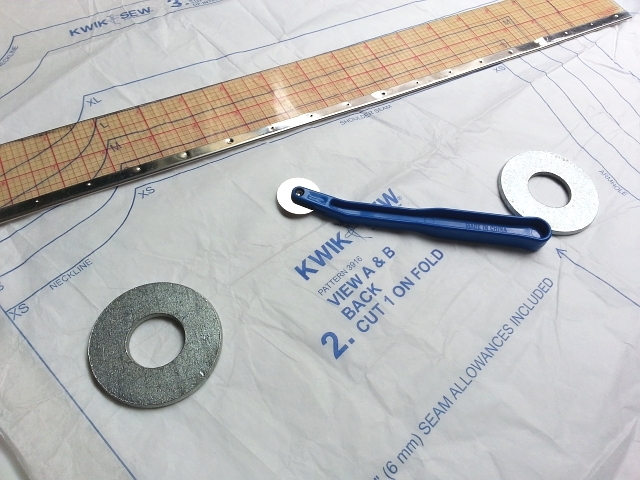 I truly prefer to cut through only a single thickness fabric. I feel more in control. The type of sweater knit I love most is far too stretchy or too heavy for precise cutting through two layers of fabric. There'll be no cutting out two Sleeves at the same time. There'll be no placing the Back pattern piece on a fold. Each Sleeve, each Front, and each Front Band will be cut out separately. (I'm omitting the side seam pockets.) For this particular pattern only the Back is designed for cutting on the fold, and so I'll need to render a full Back paper pattern piece from the tissue pattern (half the back) piece. There are many ways to create a full paper pattern piece from the tissue paper half piece original. This is where I thought I'd post a link to someone else's tutorial. But I couldn't find one for the method I use! If you've traced off any patterns, making a full piece from a half is probably intuitive. The way I do it uses banner paper, pieces of carbon paper, and a tracing wheel. First, I fold the banner paper as if it were a piece of fabric and place the tissue pattern piece I'll be tracing on top. I fold pieces of carbon paper in half, shiny side out, and slip the carbon paper between the two sides of banner paper, wherever I need to trace a line or notch or other mark. I then trace along the printed pattern lines and marks with the tracing wheel, using a ruler to make the straight lines quickly, going freehand and a bit more slowly around the curves. Last, I cut the banner paper on the cut lines and I'm left with a nice sturdy flat pattern piece. You can't see the folded carbon paper sandwiched between the two sides of folded banner paper. The tissue pattern is the top layer. I'm not sure yet how I'll handle this little seam allowance of 1/4 inch (6 mm). I've been working with an added seam allowance of 1/2 inch lately. It's a good starting point for the stretchy Hong Kong finish I'm planning and to keep any fraying (or running) away from the seam. Maybe I can get away with a 1/4 inch seam allowance because it's a wool double knit jacquard, and I don't think this fabric will fray much. Or I could trace off all the pattern pieces with a double tracing wheel and add an extra 1/4 inch to bring the seam allowance to 1/2 inch. Or better yet, I'll use the double tracing wheel to subtract that 1/4 inch seam allowance of the tissue paper pattern. It will be easier to do thread tracing that way. I've accepted the fact that I'll be working on this shawl collared cardi sporadically, in between my regular knitting/design work and the building renovations that from time to time intrude directly into my work area and disrupt me. Fortunately, when I have the time, I'm more process driven than project driven, and I'm enjoying working through this sewing pattern in spite of the changes that must be made or maybe because of the changes that I'm making. ;-) Any other process driven sewing enthusiasts out there? I'm probably more of a process stitcher too. I rarely follow written instructions and when working in a shop, it's always more of a series of brainstorming sessions of what will work and look best. Stitch samples are usually needed when there's a question of which way would look nicest. Yes! I love thinking about and discussing what will work best. Thanks for the words of encouragement, Brooke. Thank you for doing this series. I think I'm more into process too. My pleasure! Unfortunately posts will come a little more slowly than I'd like, but I'll keep them coming. Hi Olgalyn! This comment is off-topic from your post but I've nominated you for this Blog Hop thingy that's been going around...please see http://frivolousatlast.com/2014/10/07/blog-hop/. I'd love to hear more about you & your blog. Hope you can participate. Hi Lori! Well, this is fun! Thanks for the nomination. I'll see what I can do!